[Objective] Laparoscopic surgery for pancreatic disease has gained increasing popularity and a laparoscopic distal pancreatectomy (LDP) has been used in many centers because of the simplicity of technical aspect. However, actual comparative data between open distal pancreatectomy (ODP) and LDP is limited. The aim of this study is to evaluate clinical outcomes of LDP and ODP for benign pancreatic disease. [Patents and Methods] From January 2008 and June 2010, 35 consecutive patients who had presumptive diagnoses of benign pancreatic disease underwent distal pancreatectomy at the Department of Hepatobiliary Pancreatic Surgery in Tohoku University Hospital. Data including patient demographics, pancreatic pathology, intraoperative blood loss, operation time, postoperative complication, pancreatic fistula, postoperative hospitalization, and mortality were retrospectively analyzed. [Results] There was no mortality in all cases. Eleven patients underwent LDP and no patient was converted to an open procedure. Patients in the LDP group did not differ from those in the ODP group in age (57.7 vs 57.2 years; p=0.93), gender (90.9% vs 54.1% female; p=0.055), tumor size (27.4 vs 48.0 mm; p=0.068), body mass index (22.1 vs 21.5; p=0.57), and operation time (208 vs 239 min; p=0.57). However, LDP was associated with smaller amount of intraoperative blood loss (94 ml vs 421 ml; p<0.001). There were no differences between LDP and ODP groups in overall postoperative complications (63.6% vs 62.5%; p=0.94), rate of pancreatic fistula (63.6% vs 37.5%; p=0.14), rate of Grade BC pancreatic fistula (9.0% vs 16.6%; p=0.55), and duration of postoperative hospital stay (15.3 vs 19.7 days; p=0.23). Rate of complications excluding pancreatic fistula was significantly lower in LDP group than in ODP group (9.0% vs 45.8%; p=0.03). [Conclusions] LDP is feasible and safe, however, pancreatic fistula rates appear similar to ODP. 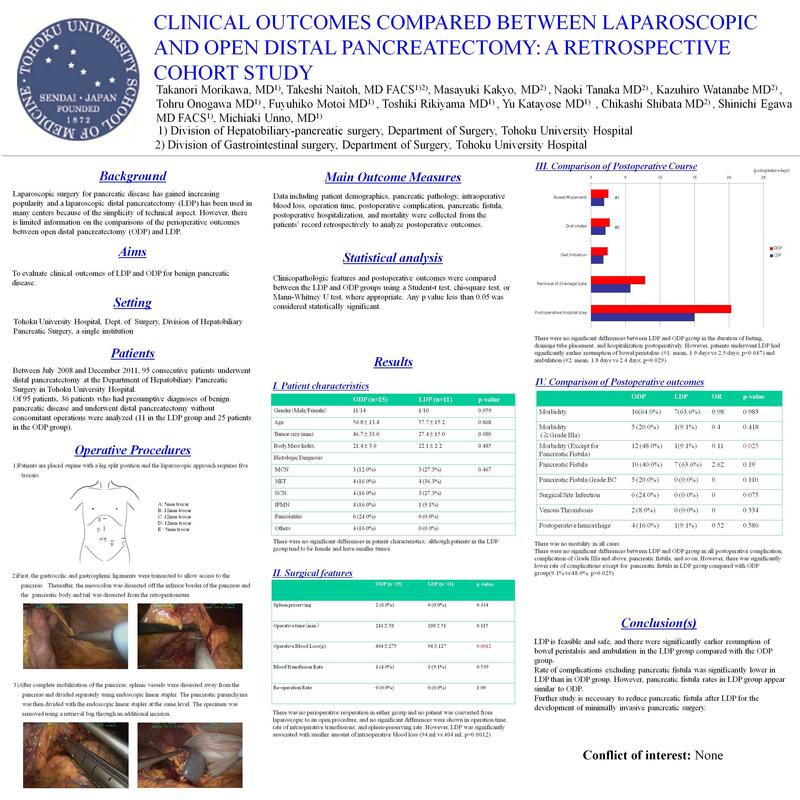 Further study is necessary to reduce pancreatic fistula after LDP for the development of minimally invasive pancreatic surgery.